Scindia also said the entire state leadership and party cadre was "working cohesively" to chart out the party's plan to dislodge the BJP government after "14 years of misrule". 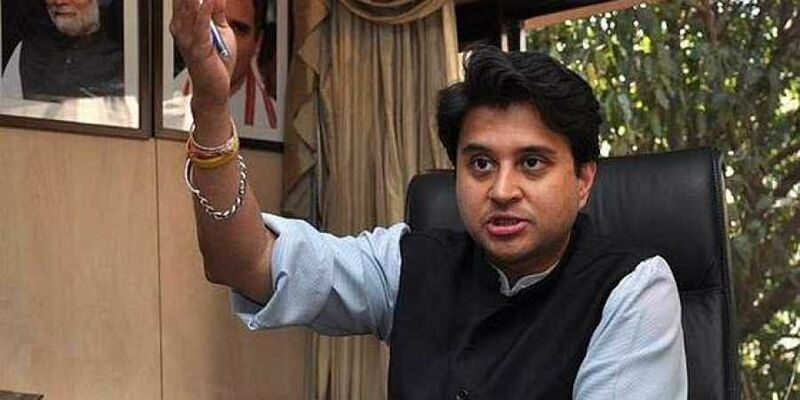 NEW DELHI: Unfazed by the BSP's decision to not align with the Congress in Madhya Pradesh, senior leader Jyotiraditya Scindia said Sunday the party is "still in the driver's seat" and in touch with all "possible partners" in the poll-bound state. Scindia, who is spearheading the Congress campaign in Madhya Pradesh, also said the entire state leadership and party cadre was "working cohesively" to chart out the party's plan to dislodge the BJP government after "14 years of misrule". Asked if the BSP could cut into the Congress' vote share, he told PTI in an interview that: "I don't think so. Obviously, the alliance would have had its own benefits, but as things stand today, support for the Congress is running deep in Madhya Pradesh. The workers are motivated and the people are looking to us for change. So, we are definitely still in the driver's seat." Replying to a query about a possible tie-up with the Samajwadi Party and the Gondwana Gantantra Party after Bahujan Samaj Party's decision to not align with the Congress in the state, Scindia said, "We are in touch with all possible partners -- our ultimate goal is to beat the Bharatiya Janata Party. We are not currently ruling out the possibility of an alliance." His remarks come days after BSP chief Mayawati announced her party will not forge an alliance with the Congress "at any cost" for the upcoming Assembly polls in Rajasthan and Madhya Pradesh. However, he said the general election next year will be a "different ball game altogether" and if state alliances don't work out, the possibilities still exist for a coalition in 2019. Scindia said the party's "driving mantra" is 'Waqt hai badlaav ka' (It is time for change), and added that this is "not a slogan, this is a reality, a commitment to change". "We are not fighting this election on the Modi or Shivraj factor but the 'people factor'. The people of Madhya Pradesh have suffered from the BJP rule for 14 years. Everywhere we look, the people are exasperated and angry," the MP from Guna said. Talking about the issues that the Congress will raise during the campaign, Scindia said the party will take the fight to the streets. "We are focusing on some key issues -- farmer distress across the state, complete breakdown of law and order, especially rising cases of crimes against women, unemployment, and massive corruption, be it Vyapam, e-tender or sand-mining." The state will go to polls on November 28 and counting of votes will be held on December 11. Asked what was different internally in the Congress organisation as compared to the past three elections and whether differences between senior leaders had been sorted, Scindia said the party was united and there were regular meetings on key matters, including on overhauling the organisation, reviving and rejuvenating party cadres and strengthening the system at the district and block level. "We understand that to fight the BJP, we will have to go down to the booth level and fight. Under Congress President Rahul Gandhi's uniting leadership, we are working as a single INC unit, coming together under the umbrella of a common vision and mission for the development of Madhya Pradesh," the 47-year-old leader said. On opinion polls putting the Congress marginally ahead of the BJP in Madhya Pradesh, Scindia said he believes his party is "in the lead". The people are now looking to the Congress for change and are hopeful that the party will bring a wave of development, progress and honesty, the former Union minister said. Asked if the Congress was bargaining hard as a result of which state-level alliances were failing and damaging prospects of a grand alliance in 2019, Scindia said the party was trying to build reasonable alliances that were mutually beneficial for all involved actors, and one that will be able to give the BJP a strong fight. "For example, in Madhya Pradesh, there was clearly a mismatch between the BSP's vote share and the seats they were demanding, obviously, that would not be strategically-beneficial for us. So, it is not about bargaining hard for the sake of debate, it is about reaching the most effective agreement," he said.